Since each monitor is tuned at 99% sRGB, the colours look amazing right out of the box. 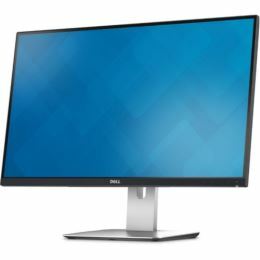 The ultra-wide viewing angle on this 68.5 cm (27") display lets you admire the QHD resolution at virtually any angle without losing those gorgeous colours. Charge, connect and project handheld devices and more with extensive ports. Count on the DellTM Premium Panel Guarantee, 3 years Advanced Exchange Service and an environmentally conscious design. Get exceptional colour accuracy and consistency right out of the box, with each monitor factory tuned at 99% sRGB with a deltaE. Help boost your productivity with a dual or multi-monitor setup and take advantage of the ultra-thin bezel that is ideal for a seamless, virtually borderless viewing between monitors. The U2715H is VESA-compatible, so you can wall mount your monitor or attach it to the optional Dell Single Monitor Arm. Should you need help down the road, this high-performance monitor also comes with a 3-year Limited Hardware Warranty4 and 3-year Advanced Exchange Service.